What’s for supper? That’s always the ultimate question. This recipe for Creole Shrimp Skewers for Mardi Gras was just the ticket on Fat Tuesday, especially since I already had all the ingredients on hand. I came across it while scrolling through my Facebook Newsfeed. Thanks for posting it and inspiring me Food Network! To make creole seasoning, mix these ingredients together in a small bowl. Not pictured: Onion powder. Man alive, this is some good stuff y’all. It’s hot, but LAWD, it’s good. I couldn’t stop tasting it. Melt 6 tablespoons of unsalted butter. Thaw, devein and peel 1 pound of shrimp (you can always purchase the shrimp ready to cook to save time). I like to use metal skewers. I find that they are much easier to thread than wooden ones, plus, you don’t have to soak them. 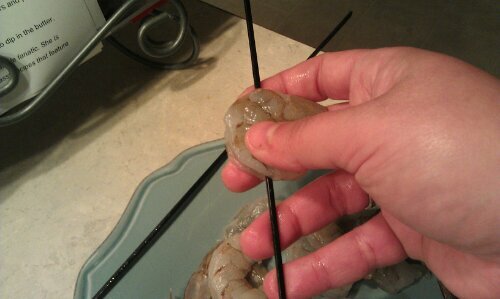 Spray them with a non-stick spray before skewering the shrimp. I had large skewers, so I put about 4 shrimp on each one. I failed to get a picture of the seasoning and butter melted because I was just too excited. However, these are the shrimp after they’ve been basted in the delicious creole seasoning and butter, all ready for the oven. Line a baking sheet with aluminum foil or parchment paper, grease and place the skewers on the pan to go into the oven. Roast for 12 minutes at 425 degrees. 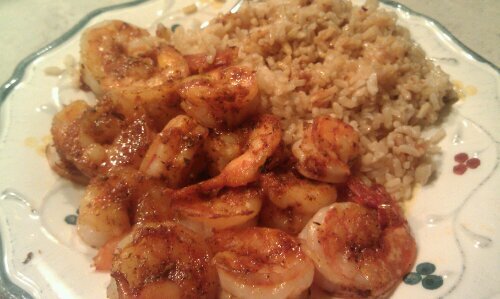 I made brown rice to go alongside the creole shrimp, then drizzled a little extra butter right over top. Seriously delicious–I mean restaurant-quality good. Definitely going to keep this recipe around!